The infection of maize with fungus Aspergillus flavus, the main producer of aflatoxin B1, and the synthesis of aforementioned mycotoxin can be controlled and reduced by applying biocontrol product based on the non-toxigenic strain of A.flavus. The biological control is based on the competition between the atoxigenic and the toxigenic strains. This is currently the most used mechanism of biological control of aflatoxins contamination in corn in all countries where aflatoxins present significant threat for human and animal health. Climate conditions in Serbia, during 2012 and (in a lesser extent) 2017, were favorable for aflatoxin contamination in maize. A non-toxigenic A.flavus isolate (detected by CAP molecular markers) was found in our region, therefore it can be spread further in these agroecological conditions. 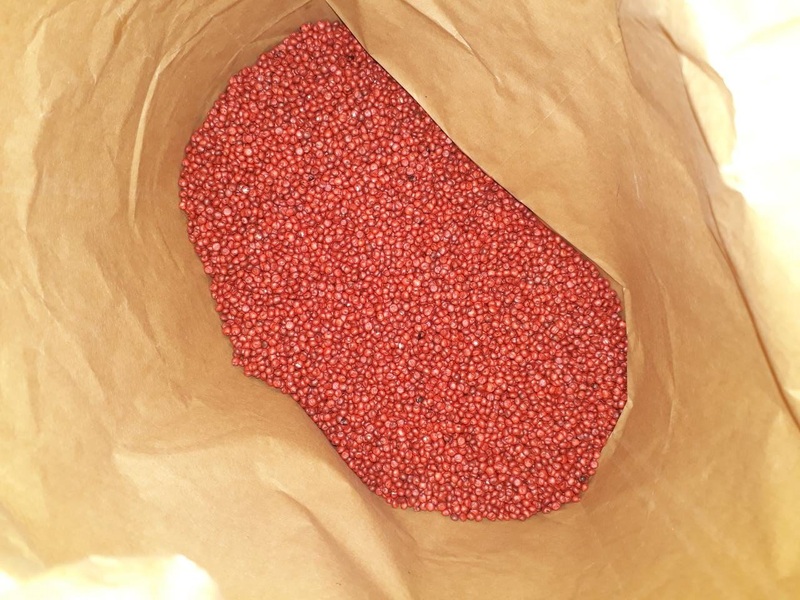 Due to its positive characteristics, we are using this isolate for production of biocontrol product. Moreover, we are currently patenting biocontrol product based on this isolate called Mytoolbox Af01. Biocontrol product is prepared by applying the spore suspension to the solid carrier which has enough starch (e.g. baked sorghum seeds) with the addition of polymers and colours. The product is applied manually in the base of the maize plants (in the amount of 10 kg/ha) when the plants develop the 10th leaf. Successful application requires favorable weather conditions right after the application (absence of rainfall 5-7 days after the application, adequate temperature, humidity and soil moisture for sporulation). Over three years (2016-2018), in Sombor and Bečej, we applied this biocontrol product based on atoxigenic strain in the fields with and without irrigation. Eight repetitions were made in every variant, therefore both influence of irrigation on aflatoxin content and influence of treatment could be determined. During 2018, the biocontrol product was also applied in Uljma (in the south of Banat region), in commercial agriculture conditions (without irrigation) on 49 acres. Recent results of aflatoxin analysis were the main reason for choosing this location. In this region, the content of aflatoxin was significantly higher compared to the other regions in Serbia. Higher mycotoxin content is strongly connected with the weather conditions that are very specific in this region, compared with other regions of the state (drier summers). The same maize hybrid was planted in April 2018 on all mentioned locations (in Sombor on April 13th and in Uljma on April 4th). 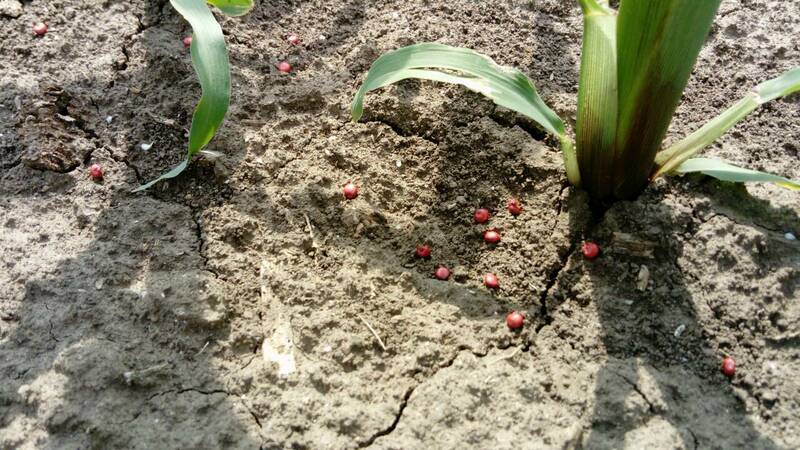 However, the weather conditions in this year were not favorable for application of the biocontrol product when the maize reached the 10th leaf stage. The percentage of soil moisture was very low in May and June as a consequence of high temperature and lack of rainfall. Moreover, humidity was also reduced. All these factors increased the risk of fungus sporulation absence on the sorghum seeds. The application has been shifted due to the lack of rain and it was performed after the rainfall that provided the necessary level of soil moisture (in Uljma on June 6th, and in Sombor on June 20th). The weather conditions were unstable and the rainy period has continued after the third day of the application. Even though the fungus sporulated on the sorghum seeds, the number of the spores has not reached its maximum. The unstable weather prolonged from the ten leaves phase to the dough phase (R4). Afterwards, the dry period in August has caused early maturation of corn. Vegetation period is shortened, and the harvest is expected these days (in September). The presence of Ostrinia nubilalis and Helicoverpa armigera was noticed. These insects mechanically damage the grains and allow the pathogen to penetrate the endosperm which also may affect the content of aflatoxins in maize. The population of H. armigera in 2018 was higher than in the previous year. On the other hand, the population of O. nubilalis was smaller than in 2017, but the insect activity was prolonged (especially in Sombor). The intensity of A. flavus infection on maize cobs is visually evaluated 7-10 days before harvest (harvest was done on 7th of September in locality Sombor). The results of the aflatoxin content in maize kernels and determination of the atoxigenic isolate (Mytoolbox Af01) spreading will be obtained after the harvest. The humidity in maize samples is reduced to 14% and the sample is milled. Then, the aflatoxin content is determined by the ELISA test and the percentage of atoxigenic isolate spreading in the field is determined by vegetative compatibility tests on the specific medium. Determination of the atoxigenic isolate spreading is carried out by isolating the A. flavus from the maize samples and then, the obtained isolates are converted into mutants on the media containing chlorates. Pairing the mutants of the isolates with known mutants of the atoxigenic isolate is done by vegetative compatibility tests. Based on this procedure, it is possible to determine if isolates are genetically related to oxygen isolates (formation of heterokaryon with the presence of sclerotia indicates the positive reaction).